I’ve wanted to visit CAT for circa 8 years, but it had always being to far out the way to justify. However being just over an hour away from the build, I finally got a chance to visit and it was fantastic! Far better than I had expected and I would encourage anyone to visit if you get the opportunity. 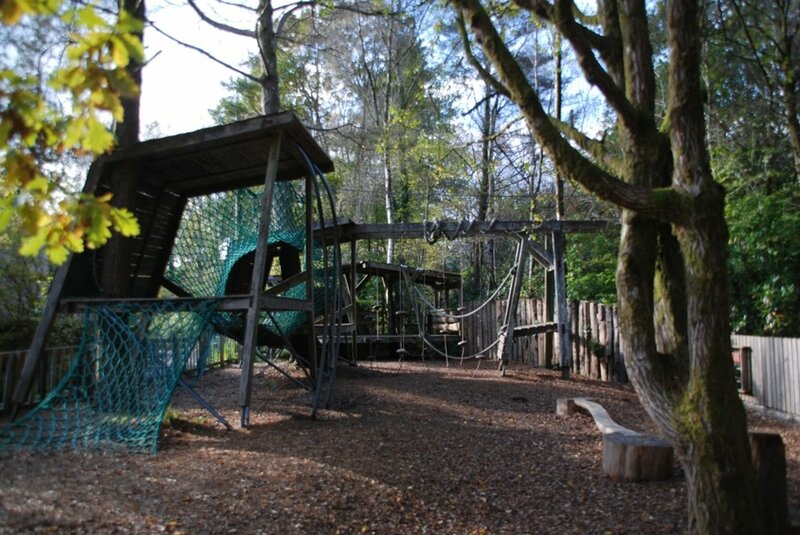 They have many great activities for kids, and information is fun and accessible to people of all ages. CAT has one of the best gift shops with a fantastic selection of book for the sustainable nerd! Only problem is choosing which ones to buy! But whilst you’re choosing your books you can marvel at a beautiful rammed earth wall. There really is too much great stuff for me to list here. 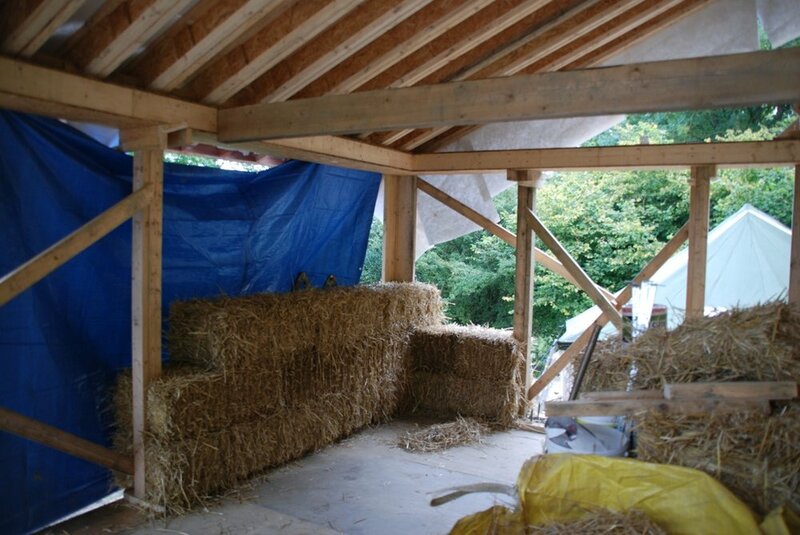 However some my highlights where; seeing the Ecococon modular prefabricated straw bale panels and how they work. 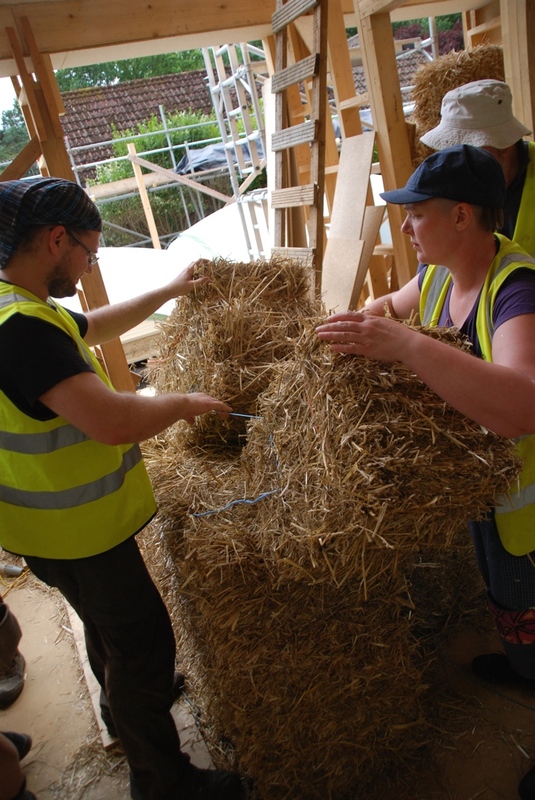 I believe this system could help make straw bale building more accessible to the commercial sector. Producing great results, in a relatively short period of time. For more information please visit the Ecococon website http://www.ecococon.lt/english/. The roof plate was held up with folding wedges, to hold it higher than the finished height of the wall. This was to allow room to manoeuvre the bales into position and to allow for compression. Once the walls where built and the roof was ready to be dropped, the wedges could be knocked out, allowing the roof plate to drop down steadily. All 8 sets of wedges where knocked out simultaneously, to lower the roof in a controlled and even fashion. Our bales compressed circa 10-15mm per bale, which accounts to 60-90mm for the whole wall. The weight of the roof alone will do a lot of the compression of the walls, but we wanted to speed this process up and make sure the whole roof plate was level. This was done with a number of ratchet straps and our trusty water level. With the ratchets wrapped around our roof plate and our box beam, we where able to make adjustment to ensure the roof plate was level around the whole building. The roof plate was then fixed into position with screws into the window / door posts. From this point in it is very important to have fire extinguishers onsite, (if there isn’t one in place already). 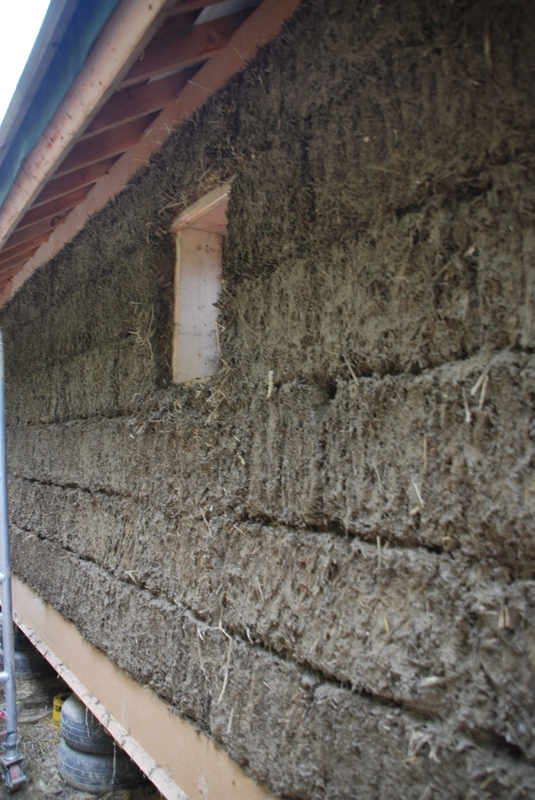 Whilst straw when compressed or covered with lime/clay gives a very good fire protection (2hr+), lose straw is just tinder! Therefore lose straw should be swept up regularly. Lose straw is also very slippery, and you can lose tools in it, so a regular sweeping is most important. Before we can do anything with the bales we first need to ‘dress’ them. We do this because bales aren’t actually 100% rectangular, they tend to bulge a bit at the ends. So by ‘dressing’ what we really mean is flattening off the ends of the bales. So when in course we can have a flat end against a flat end. Therefore improving our air tightness, and insulation values. The way to ‘dress’ a bale goes something like this; Stand bale up on its end, move the excess straw under the string from the bulge to the low point (this is normally a bulge in the middle, to the edge), this is generally best done by hand. Once you have done this for both strings and both sides pull out any excess straw from any remaining high points, but not so much that the strings become lose! A little check at this point is the strings should now look flat against the bale. 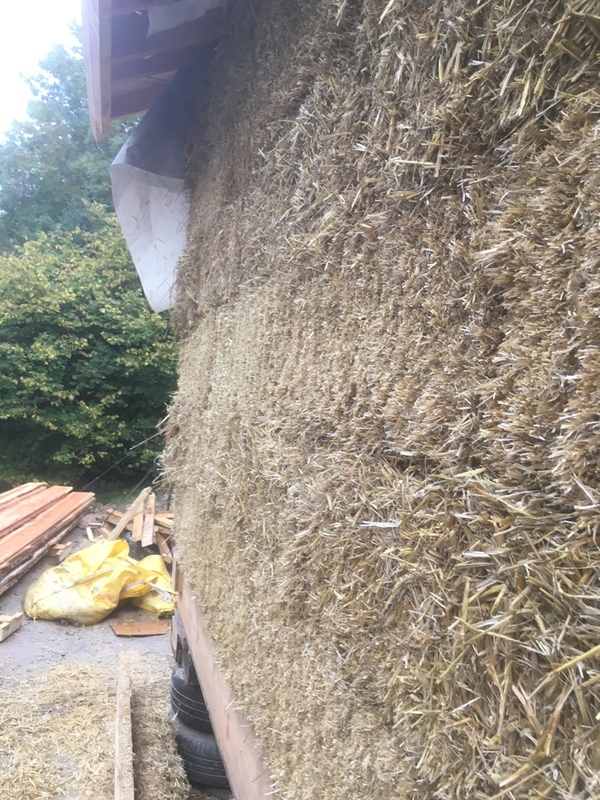 Now flip your bale on its other end and look how it is standing, if its leaning forward / backward or side to side, its not flat and will need further dressing…. Repeat this process until its flat & then repeat for the other end. Now you should have one dressed bale. Please note that dressing the bales reduces the length by circa 30mm, so make sure this is taken into account for your measurements etc. When putting the next bale in try to get it snug up against the first bale. This will mean better insulation / air tightness values, and save on the stuffing that comes about later. This is very important, SNUG NOT TIGHT! If it’s tight, it may cause the whole wall to snake, and takes a hell of a lot longer to sort out, than if you did it properly in the first place! Don’t be tempted to cram bales in where they’re tight. The only reward for being a strong macho person in straw bales is the fact you get to practice correcting your mistakes! At the corners of the building, it’s important to tie are bales together to give them added strength. First tie the string to the inside bale, then loop under and over the first string, then loop under and over the second string and tie up. Remember snug not tight! This is my crude plan showing the tying of corners. Stuff vertically in between bales where the strings meet, as there is normally a slight gap here. There shouldn’t be gaps anywhere else, as the bales have been dressed! Remember snug not tight, or the whole wall may begin to snake! There is no need to stuff horizontally as this will compress. If there is any horizontal stuffing, the compression could become uneven! Depending on the machine used, most bales have a cut and folded side. The cut side is better for plaster adhesion, so this is the side we have on the outside for the first course. As it could be a potential weak spot for plaster. But we need to alternate the cut and folded side per course, as the folded side compresses more. So if we did it all cut side out our walls would bow! 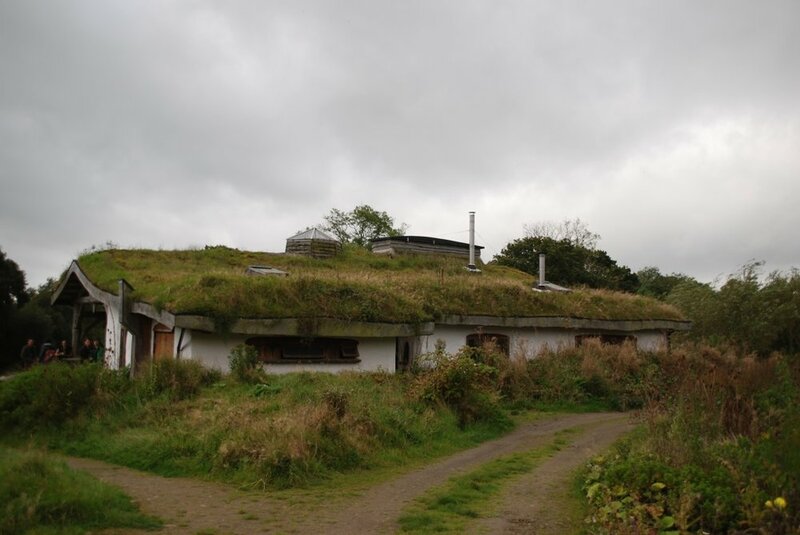 Hey, so this was a little cob studio we went to visit in the next valley. Was a really cute little place, which some great features. 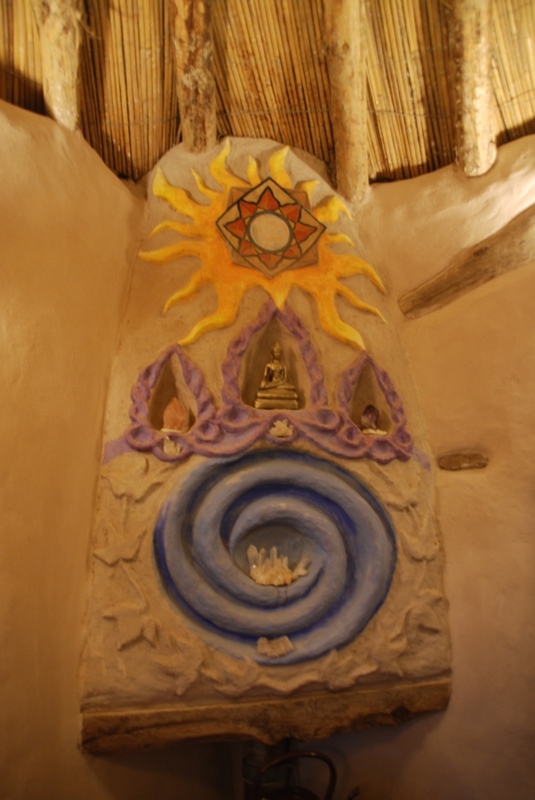 The only thing I would say though is because it was a studio / yoga place, and therefore not heated full time, the thermal mass of the cob didn’t really come into play. So it felt quite cold in there. 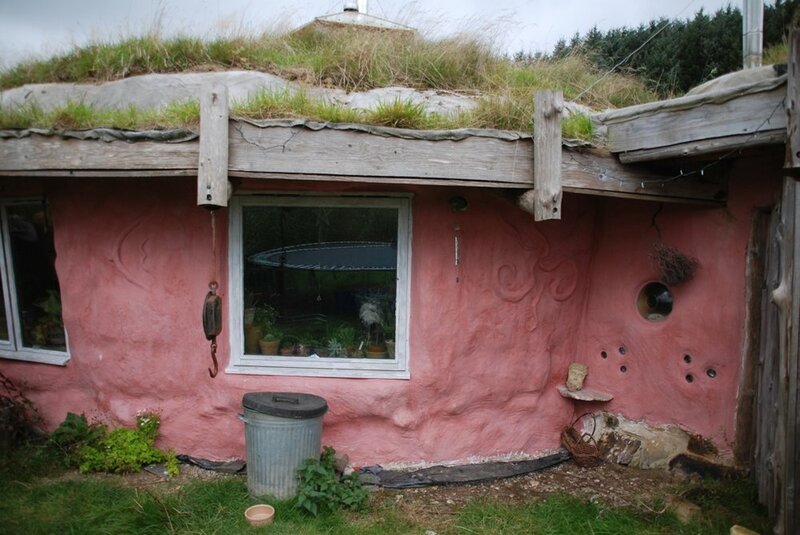 Cob as I’m sure you know is not an insulation, but it does act as a thermal store. Meaning if it is heated constantly, it will retain the warmth. 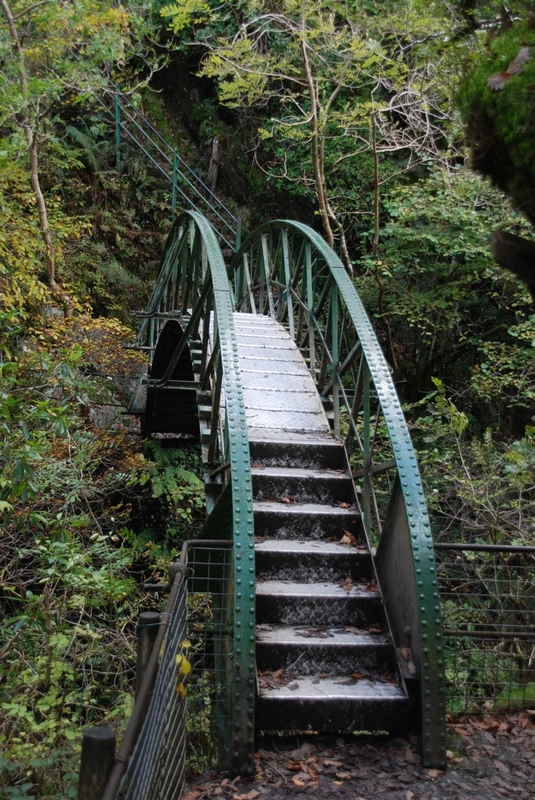 It can therefore help regulate temperature fluctuations. A couple in there 60’s with the help of a friendly builder, built this over a period of a year. I don’t think that’s too bad going, especially since I know they struggled with health problems during the build. So we've braced our window/door posts, this is to stop them bowing when the straw walls are built. Our bales will sit on a base plate this is a timber ladder fixed directly onto the box beam. 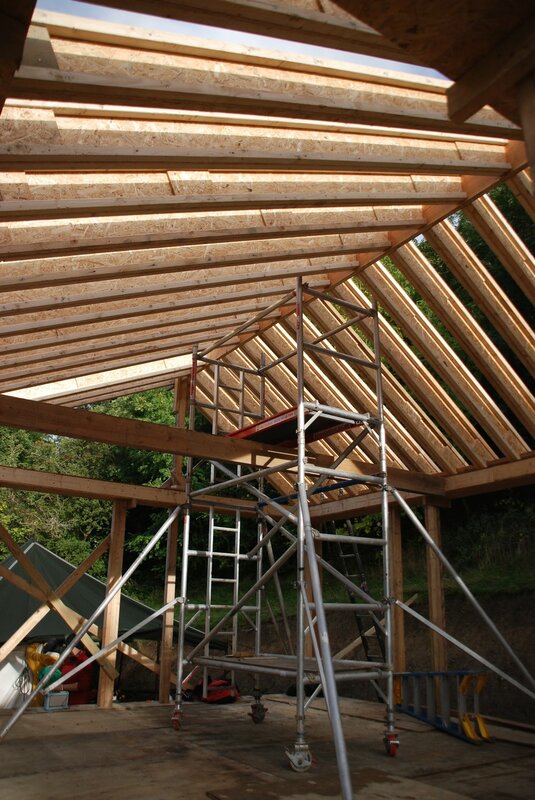 Its job is to raise the straw bales above finished floor level. Meaning that if there is a leak/spill the straw won’t get damaged. It also can provide a fixing for skirting boards. The base plate will also provide fixings for our stubs. The stubs hold the straw bales in place. Now normally in England there are 2 quite chunky hazel stubs per bale, and these stubs are held into position in the middle of the bale with noggins. 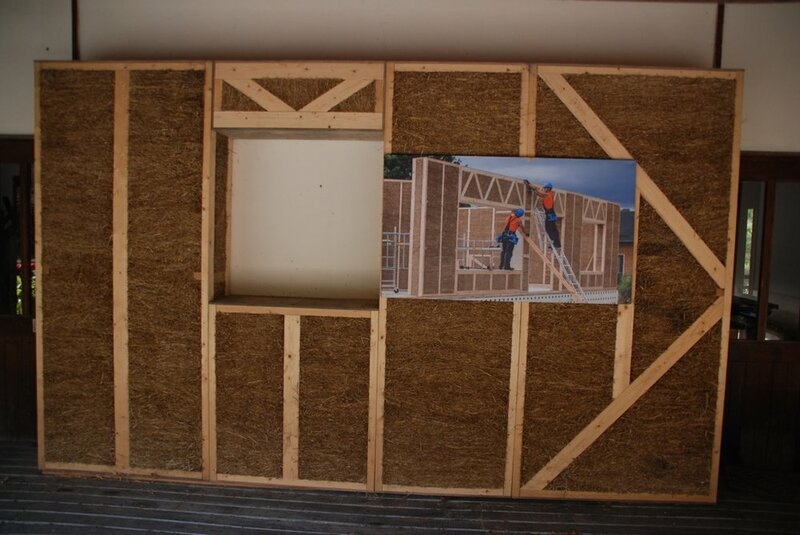 This is a picture I have from an earlier Straw Works course. However the noggins aren’t insulative, and therefore could potential act as a cold bridge, and will definitely reduce the amount on insulation that can go between the base plate. Now in America they tend to hold the bales in place using nails that are only part driven in to the base plate. This is quicker, reduces the amount of noggins and therefore potential of cold bridging. But it introduced other problems, such a condensation on the nails, which can lead to decay (both of the nails and the straw). So looking at these two methods we chose to use a hybrid method. Smaller ash (hazel is best to use, but we could coppice the ash from 5m from site!) stubs running along the ladder. Thus reducing noggin and the potential for thermal bridging, but not introducing the problems of metal within a straw wall. With our rafters in place we can move on to making the building weather tight. First job is fit the out riggers that are going to act as our roof overhang, and give our straw bales a ‘good hat’. They also mean that the gutter is outside the building shell, meaning they if there where a leak in the gutter, it shouldn’t leak into the building. The outrigger on the east & west side where then simply fixed to the rafters, and lined up to get them all level. As part of our roof build up we are having a breather membrane above our rafters with a 50mm ventilation gap to move any water vapour out of the building. 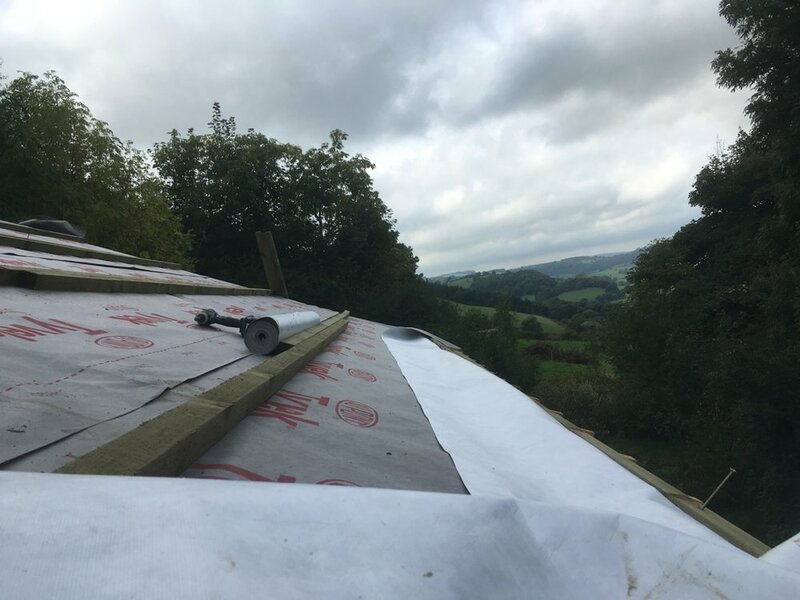 To install the breather membrane we first rolled out our ‘paper’ over the rafter at the lowest point before being stapled into place. Before we could lay the next stage of paper we nailed some temporary batters to give our selves something to work off (we are not all nimble mountain goats, like our pet roofer and all round good guy Joe Duirwyn! (part of Hartwyn.co.uk, along with Jeffery). Side note, batterns go at 90° to the rafters, counter batters run in the same direction as the rafters. But are called counter batters because they are counter to the normal plane of batterns. We next installed outriggers to the north & south side on our roof. These can then be used as a ladder to help us move up and down the roof. I have to say it’s a shame we can’t incorporate a roof deck up here because the views are amazing! Larch is a very hardwearing board due to the high sap content and should need no further protection. 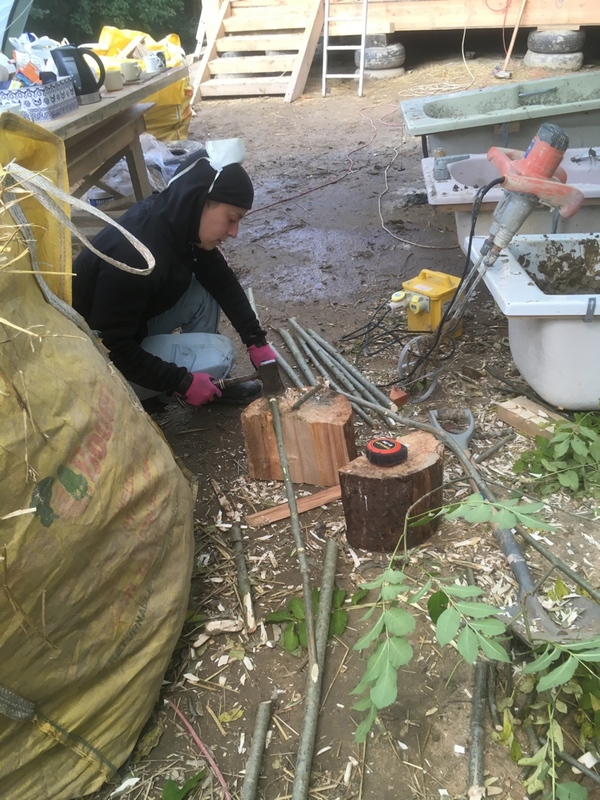 It has only been rough sawn, so therefore has minimal embodied energy compared to sheet materials. It is half the price of the equivalent sheet material. It gives us a beautiful soffit detail when looking at the soffit of the overhang and just generally looks better in my opinion. We installed our waney edge board at a 45°, both for strength and to give us a nice soffit detail when viewed from below. As is a very old tradition with roofing, we had a topping out ceremony. This involved a branch of a mighty oak tree, and a wee bit of bubbly. 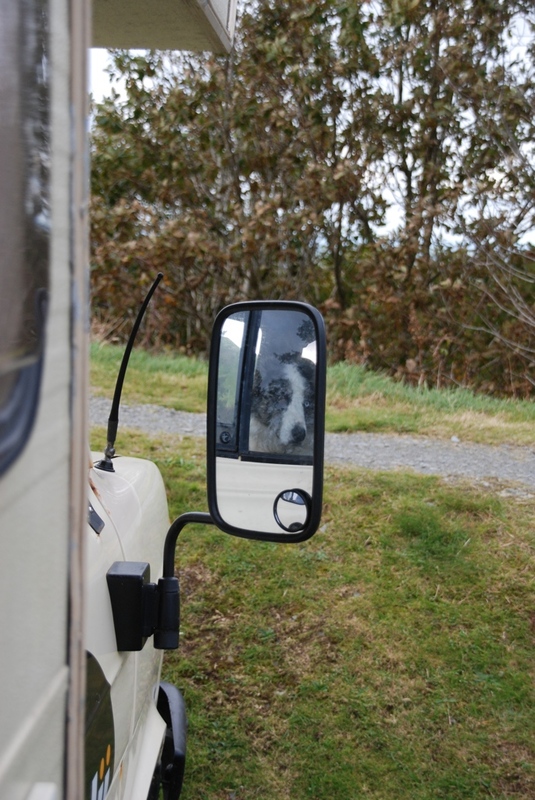 The place we’re at is amazing, lots of nice places to take the dog for walks. There is just so much abundance to be found in nature. It’s been really nice getting back to being in harmony with the environment around us, both on and off the build. 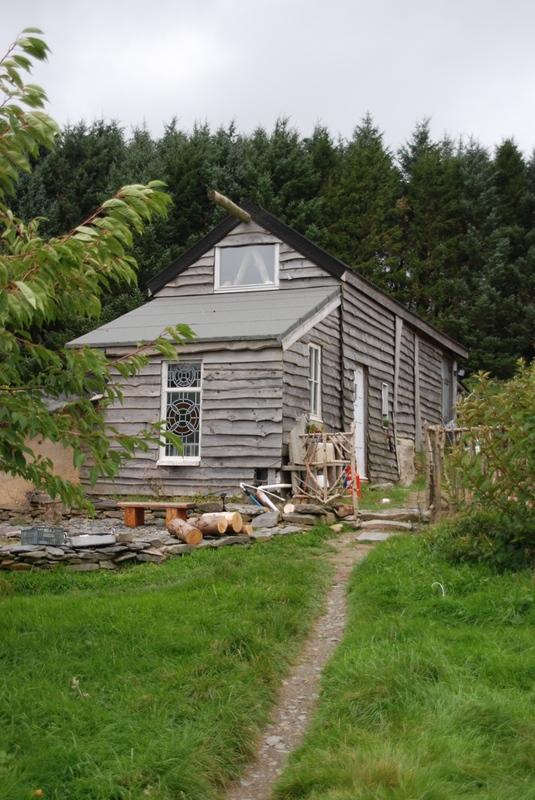 This harmonising has included, foraging for wild mushrooms, jam & syrup making from the wild berries and plants around the property, and making spoons from the ash on property. Our build is going to be a load bearing structure. 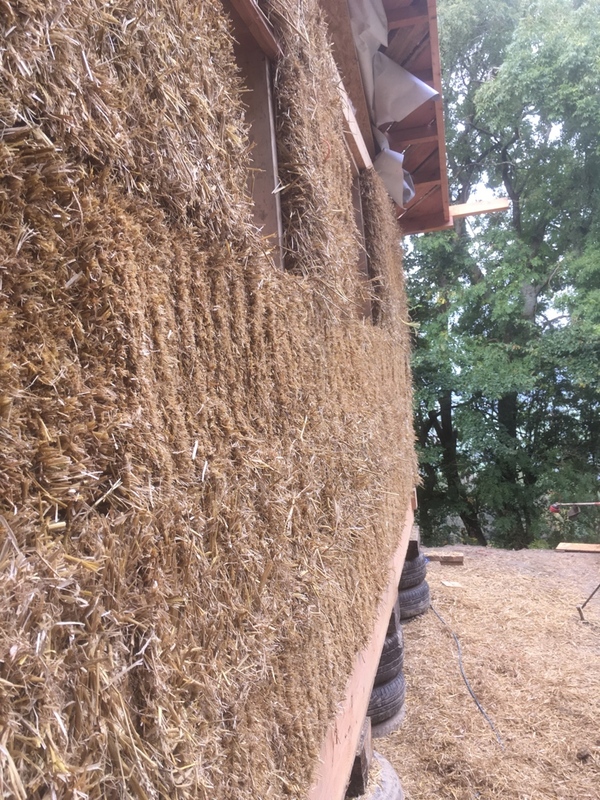 This means that as well as providing insulation, our straw bales are also going to be structural and what will essentially be holding up the roof! Load bearing has a reduced amount of carpentry work involved and the carpentry is simpler. This makes it more suitable to the self-builder. It’s also getting the straw to do two jobs, therefore your getting your moneys worth! The ring beam is made out of durable timber (in our case larch), with 18mm OSB3 (exterior grade OSB, we used ‘Smartply’ as it has no added formaldehyde) top and bottom, glued and screwed together. Infilled with sheep’s wool insulation and with full depth noggins at 1200 centres, and at either side of a window/door post. 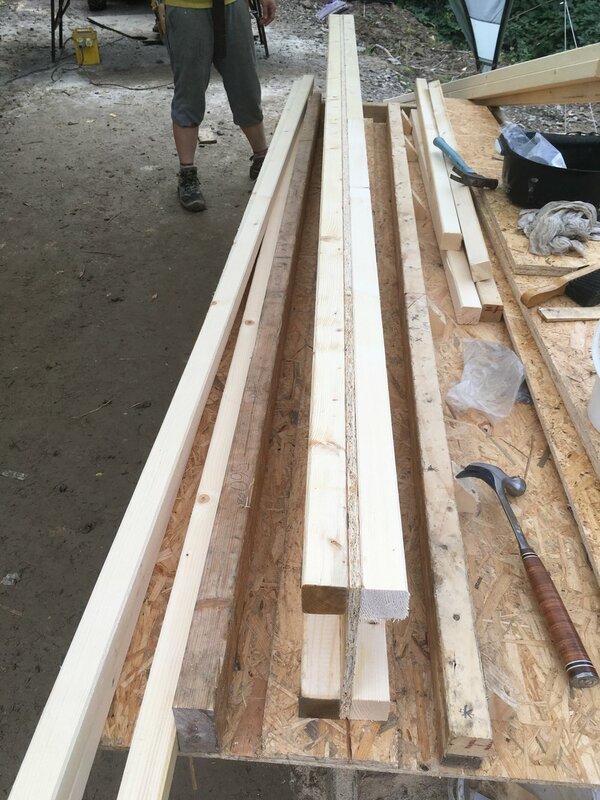 When building our ring beam we used a chop saw, this not only speed up the process, it also ensured our cuts where square and it all fitted together nicely. 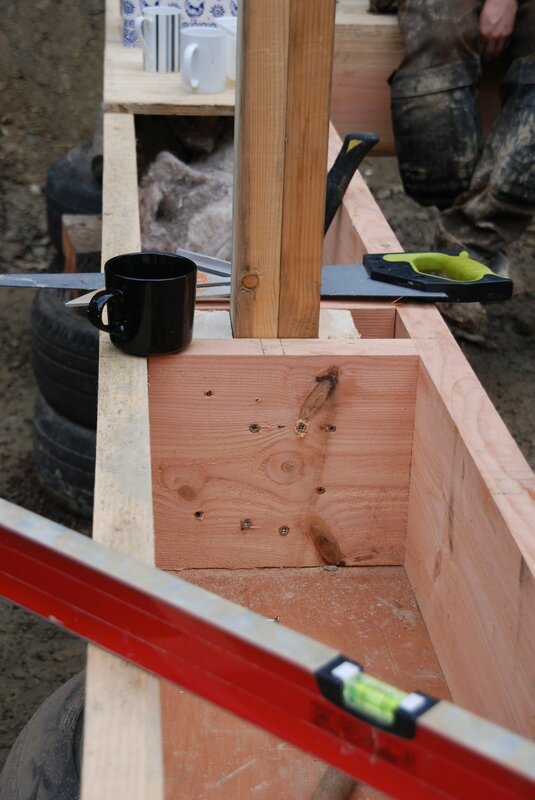 Of course we had to have joints in our box beam between the timber and OSB3 top & bottom. Where this occurred we made sure our joints where staggered by 600mm. This helped to ensure we weren’t creating weak points within the box beam. We also made sure to stagger our joints at the corners for the same reason. 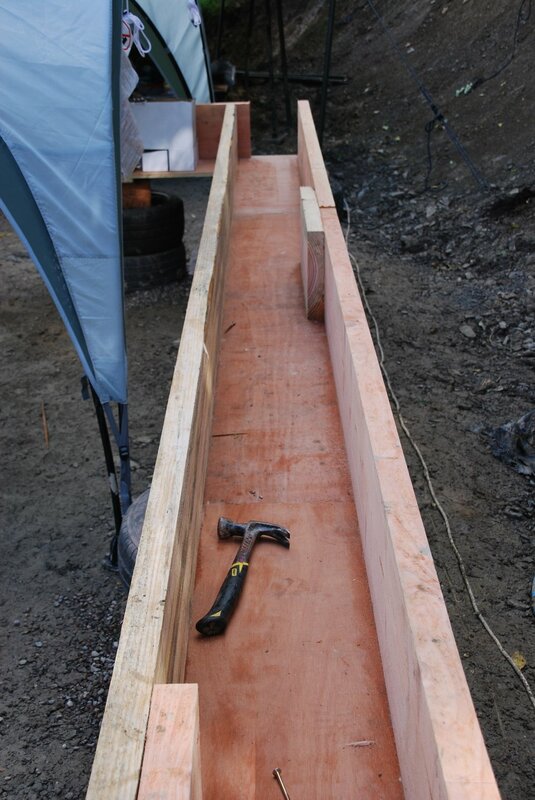 Where timbers are joined, the joint has a secondary timber spanning 600mm (300mm either side of the joint) on the inside of the box beam This can be seen above. It’s generally agreed that the straw needs to be 300-450mm higher than the ground. This is due to splash back, moisture etc. 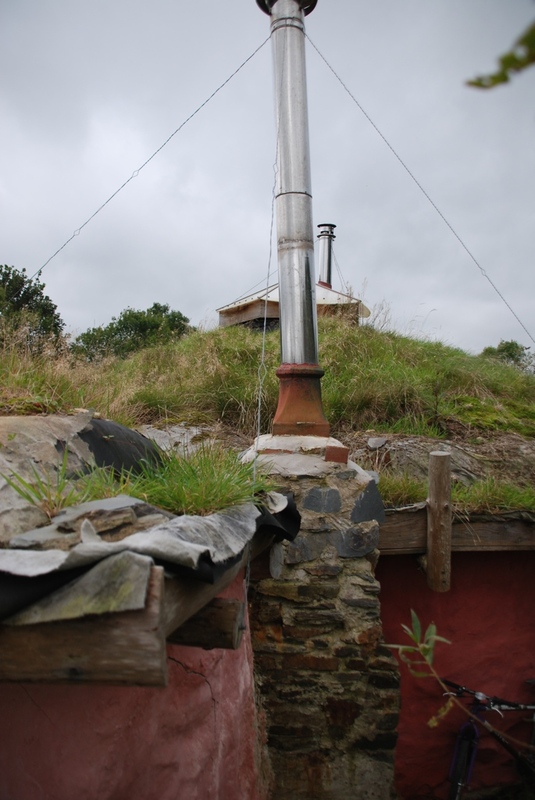 On a conventional house the DPC would be at 150mm for the same reason. 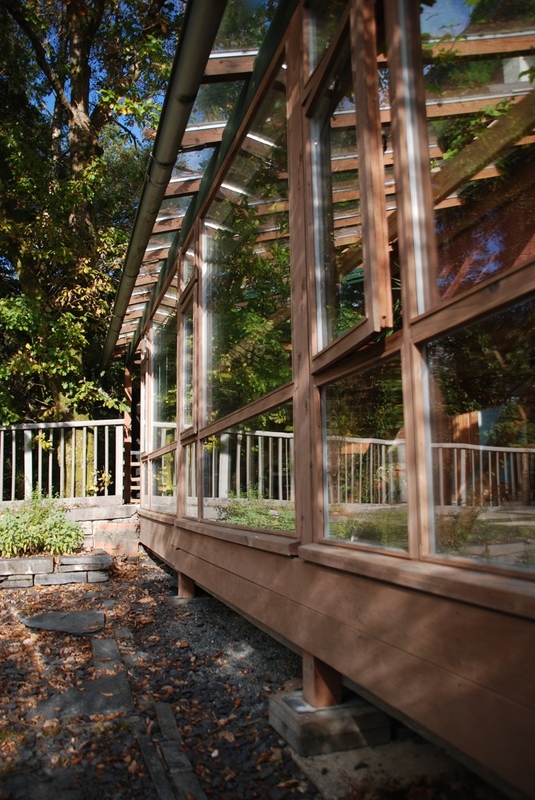 On our build we achieved this with a combination of the pillar foundations and the box beam. We were actually higher than necessary. This was to give us an easier space to work in when under the building etc. For our window/door posts we chose to use two 100x50mm (4x2) screwed together. The reason being its cheaper and stronger than 100x100mm posts! If you are trying to save costs it is possible to use a less durable timber on the inside face of the box beam. However this only really applied to the box beams higher up e.g. wall plate and roof plate. As you want the one sat on your foundations to be very durable! Level ground where you’re going to place your 1st tyre, and lay a thin bed of pea gravel. 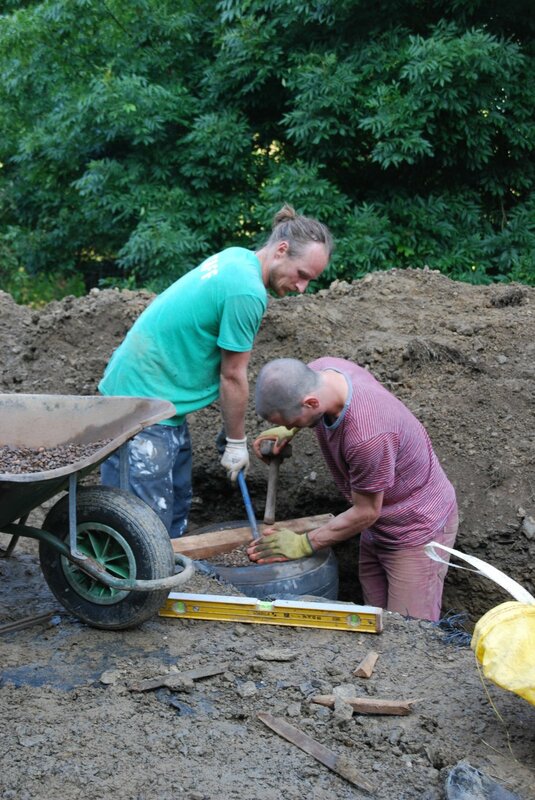 Place the tyre on the gravel and ensure it is level using a spirit level (2 foot level seems to work well). Fill the tyre up to the 1st lip where the tyre would have joined the rim. With your fingers jab the gravel under the lip until all the gaps are filled. 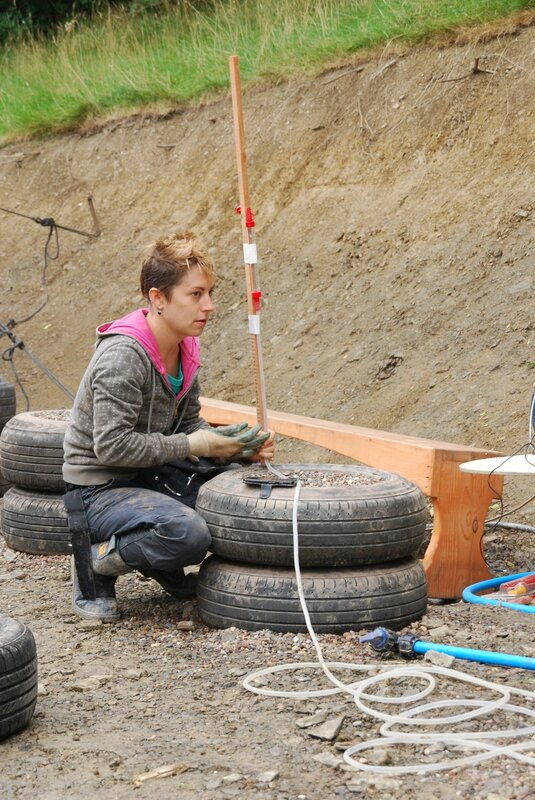 Fill the remainder of the tyre up until the second lip, and heap up a bit of excess gravel. With the help of a friend, twist / lift up the lip / edge of the tyre and jab as much pea gravel in as possible, working your way around. The more you can jab in now the easier it will be later. Now rest you wood on top of the tyre, so you have a solid platform on which to rest your crowbar. Wedge your crowbar under the edge of the tyre and stuff gravel until you can fit no more. Now hammer the gravel into the side of the tyre, topping up with gravel as required. Repeat this around the tyre, until when you try to squish down the rubber edge of the tyre with a finger there is no movement (I found it took going around about 2 or 3 times before it was solid). Once solid, check your levels of the tyre working your way around like a clock face. 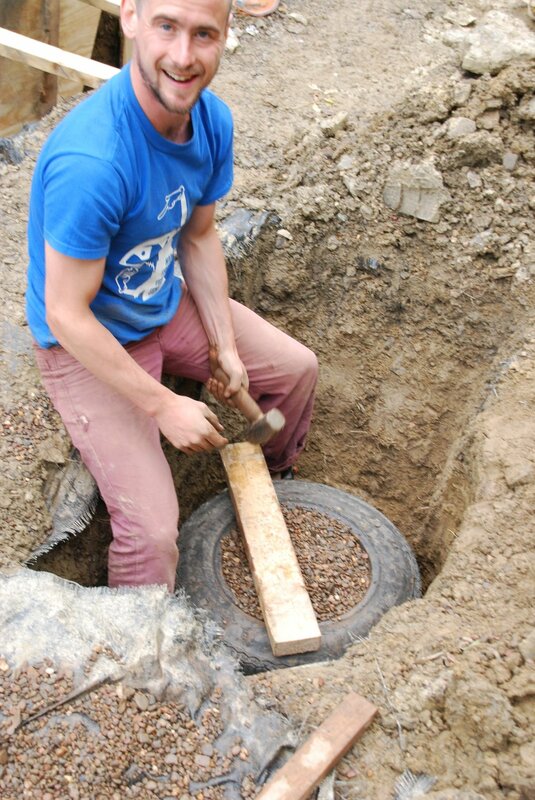 If you find low points, lift up the tyre rim with your crowbar and pack with more gravel using your lump hammer. Until the level is right. Never take gravel out of high points, only fill in low points. We estimated that whilst learning it took between 30mins to 1 hr per tyre. Place the next tyre on top of your 1st centrally & repeat the steps (If not central, more work needs to me done at the levelling stage). It is worth noting that each tyre will be approximately 30mm higher when filled, compared to an empty tyre. We use 10-20mm pea gravel in the tyres, as it can be compacted enough to give us the structural stability needed. But the gaps in-between the gravel are big enough for an excess water to drain down. But small enough that water can’t ‘wick’ up. 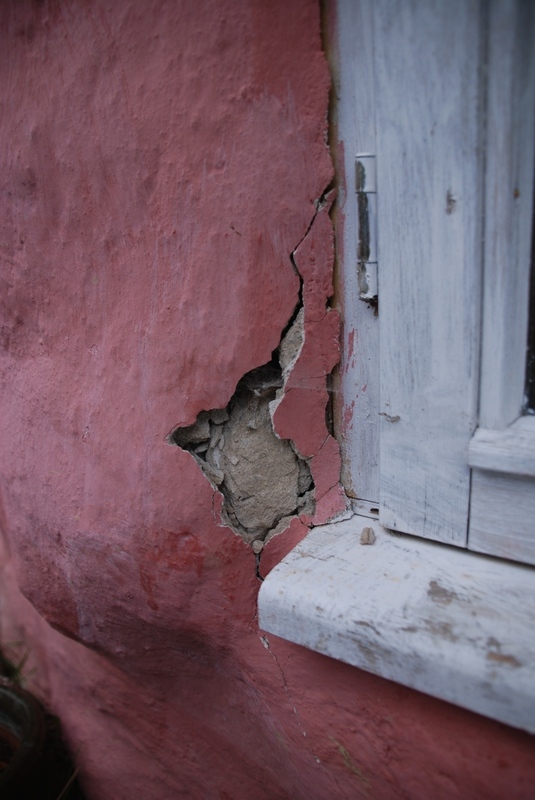 By carefully thinking about materials we are using, we can avoid the necessity of a DCP (damp proof course, used in brick work to prevent water ‘wicking’ up), this means fewer polyurethane products are needed. Which is better for the global environment and helps the budget! Generally speaking you try to avoid any materials that would prevent the straw bales / natural materials from ‘breathing’. So if you’re in a situation where you want to use a DPC, it’s probably best to go back to the drawing board! Please note when picking up tyres from your local establishment, lorry rims make rather good fire pits!